L: 48" x W: 25.7" x H: 19.3"
Kitrell Coffee Table Make your living room look chic, rustic and inviting with the Kitrell coffee table. This stylish occasional table features a distressed finish and plank styling, giving the appearance of reclaimed wood. Plus, the deep chocolate color and pewter hardware finish add even more appeal. Make your living room look chic, rustic and inviting with the Kitrell coffee table. This stylish occasional table features a distressed finish and plank styling, giving the appearance of reclaimed wood. Plus, the deep chocolate color and pewter hardware finish add even more appeal. So far all of our guest love the coffee table, as we do. It fits in with all of our furniture! 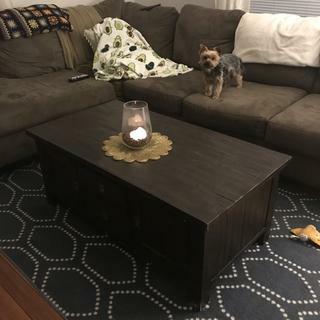 Our old coffee table was a little too small and too low for our couch. This one is the perfect height and size for our sectional. All of our guests have commented on how great it looks with our furniture and they love the distressed look of it. We love having the extra storage with the 2 cabinets and 2 drawers. Space changer! My living room looks incredible now with this piece in it! There is so much I love about my new table, for me the best part is the drawers that slide out either way as well as the doors that open on both side. We love that it’s on wheels so that moving it to clean is easy! Solid and functional. Love the double sided drawers. Little pricey but glad I bought. Absolutely love this coffee table!! I love the rustic style as well as the storage space it has!! Gorgeous! We bought this because it was NOT smooth and already has a rough top. With two children this is perfect. My kids always have things on top of the coffee table and when they are done everything can hide in the drawers and cabinets. My daughter climbs through one side of the door and out the other. This coffee table has held up well to the abuse my children put it through and it still looks great! When we saw this coffee table, we said that "This is it." Me and my husband fell in love with it. Looks great , stable and strong. Lot of space for storage. Easy to clean.lot of room to play games. Great table, solid wood. Any scratches can be concealed with a furniture pen. Love the storage too! Great coffee table, has plenty of storage space on both sides. Bonus drawers on act side so this is a win win piece! The rustic/reclaimed look of this table is fantastic. It really fits the character of our house. Sturdy, good quality. Perfect for families without little ones. I really like this coffe table, however I would caution for those with little ones. The drawers can easily pinch a finger or two. The storage space is perfect. is the hardware on the end tables/coffee table chrome or bronze? BEST ANSWER: It looks like bronze, is a metal, I truly recommend you this table is really strong, the material is really good and very useful. I love it. It’s strong wood, it’s not metal. What is this made of? Is this real wood? I am interested in the Kitrill coffee tables and the Kona Grove TV console--do the finishes match? BEST ANSWER: The finishes are slightly different between the two pieces.